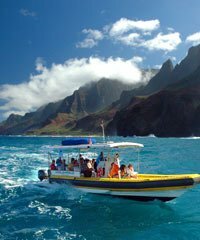 The Napali Coast tours on the island of Kauai, without a doubt, offer some of the most amazing tours to be found in all of Hawaii. This 11 mile stretch of the island is so remote that it can only be reached via the sea, the air or one incredible and somewhat dangerous walking trail carved high up above the waves along a stunningly beautiful cliff line. 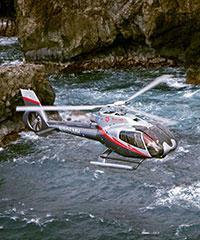 Many of the tours offered by Tom Barefoot's Tours are available at discount pricing. 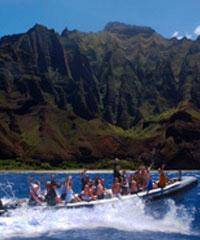 Before discussing the various Napali Coast Tours, you should know a little bit about the Napali Coast itself. 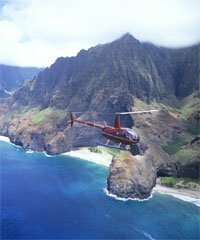 The Napali Coast is isolated from the rest of Kauai by its tremendous and almost impassible cliffs which descend thousands of feet from the mountains above directly into the ocean. 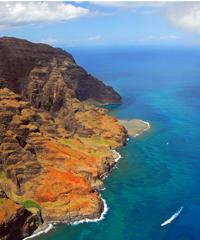 This coastline is believed to have been the original home of the first Hawaiians arriving on Kauai. Although the environment with its steep cliffs and often harsh ocean conditions may seem inhospitable, it actually provided very nourishing living conditions. 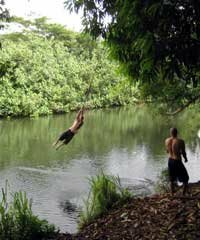 There was plenty of fresh water, the valleys were lush with abundant fruit and plant life which also allowed for a certain degree of cultivation and the ocean waters provided ample quantities of fresh fish and marine life. Small villages were established and thousands of Hawaiians were known to have lived back up in these beautiful valleys. 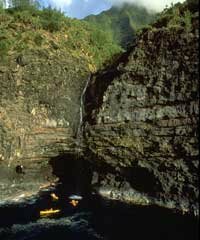 The extremely beautiful and isolated Na Pali Coast of Kauai was thought to have been inhabited in the "pre contact" days prior to the discovery of Hawaii by Captain Cook. 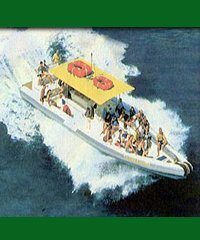 The Na Pali Coast was actually a central location in those days inviting commerce between the regions of Hanalei, Waimea and the small island of Niihau as well as the much smaller islands of the Hawaiian archipelago located to the north of Kauai. 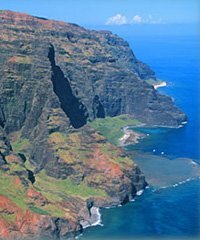 Extensive stone walled flat terracing can still be found on the valley floors where Hawaiians once lived and harvested their taro and these rock walls and terraces can be seen on some of the Na Pali Coast tours we offer. 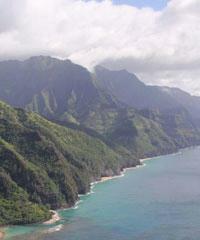 The Na Pali Coast cliffs consist of a robust tapestry of deep and narrow valleys ending abruptly at the sea. Geologically speaking, this type of valley is referred to as a "hanging valley". Instead of the valley continuing onward along the seafloor out to sea it ends abruptly at the sea shore where the constant and vigorous wave action carves the valley floor away at cliff's edge.Waterfalls and raging streams continue to this day to cut these narrow valleys. 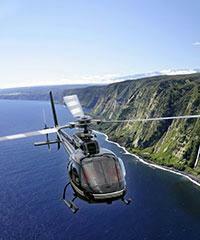 These Na Pali Coast Tours offered by helicopter flights are amazing. 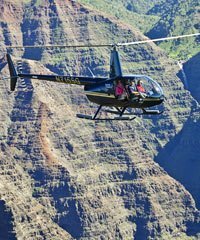 In fact virtually all the helicopter flights found on the island will visit NaPali because it is simply the 'gem' of each tour. 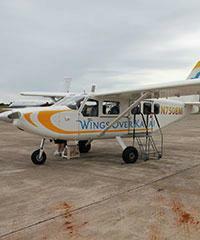 via fixed-wing aircraft. 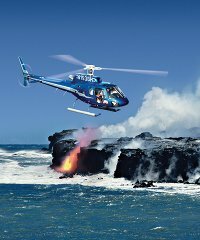 These overflights of the Na Pali Coast are similar to the helicopter flights but they just skirt the coastline and don't hover like the helicopters. 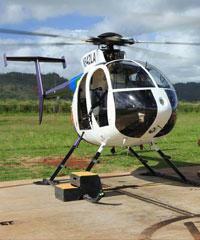 These Napali Coast tours are generally much less expensive than their helicopter counterparts. During the summer months when the sea conditions are the most favorable, magnificent kayak tours are offered that traverse the entire 11 miles of coastline. You kayak just one way and are picked up by van on the other side. 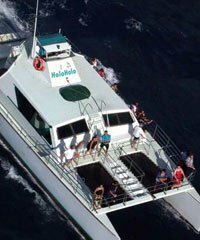 These popular tours usually begin from the Port Allen area and take you on a half day excursion up the shoreline to visit the Napali Coast. 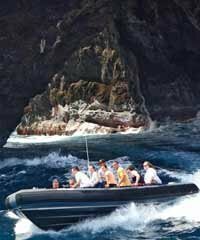 During the summer months these tours are very popular and are often sold out. 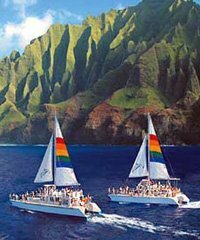 To see the Napali Coast at sunset on a dinner cruise is a special treat. 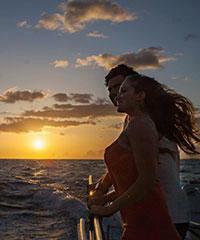 These cruises are longer than dinner cruises on the other islands generally taking 4 to 5 hours. 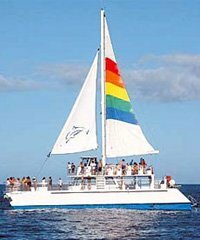 These tours will also include snorkeling but are very speedy and are also ideal for touring the caves found at the base of the cliff line. 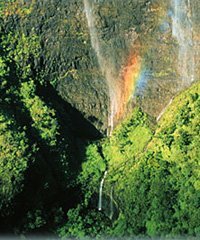 Certain hiking tours will take you along the narrow trail winding the cliffs of Na Pali. These generally just take you in a couple of miles and return as any longer journey will require spending the night. 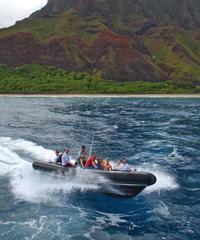 Do you still have questions about Napali Coast Tours? 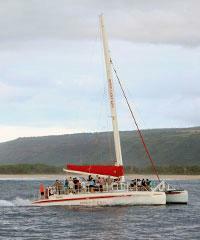 Can we take a Na Pali Coast Tour from the Hanalei area? 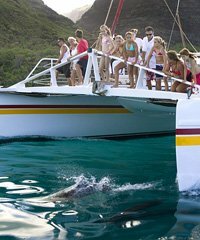 Swim with the dolphins on Kauai? 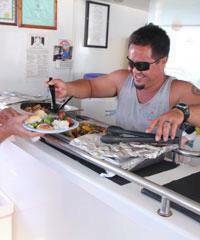 Why are dinner cruises on Kauai so long? 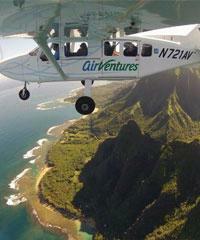 So if you're going to visit Kauai, you simply have to find a way to get to the Napali coastline. It is really one of the magic places on the planet. It's a wonder of the world, if you will. 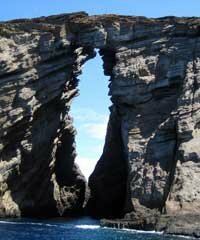 It is certainly one of the most dramatic sightseeing locations you could possibly imagine. It's only located on the island of Kauai. As you can see, actually, let's do this, let me just show you where it is on the island. So, here's Kauai. We have the north shore and the south shore. This coastline, this kind of flat area here, is where you find this expansive, 11 miles or so of beach that's called the Napali Coast. It's on the north shoreline, so that means it is a place that is in the wintertime, it is pummeled by waves that come through, and wind. That's when we have our really strong surf. That's partially, those factors are what's responsible for making that coastline the way it is, that coastline just crushing in underneath, pounding away at the bottom of it, and then causing it to loose its anchor below and the soil above it falls and ends up in these giant cliffs that you have coming down. Then the rain, extreme rain, and extreme wind that we have, make it just kind of wear away a road the surface area of those cliffs into these ridges, really narrow ridges, that go straight down on either side and also create these spires and so on that you see, with lots of just foliage and waterfalls that come off the top. Down below we've got these incredible, idyllic white sand beaches that are there, and sea caves that are just kind of carved into the rocks, arches and little land bridges that happen all over the place over there. So it's very beautiful. Oftentimes, these cliffs are thousands of feet, so you'll actually, from the ocean, maybe looking up you'll be able to see them ascend in through a layer of clouds, if that's what's happening that day. So it's a really kind of magical spot, the place where gods would live. It is one of the most beautiful places that you could find anywhere in the world. This is a place you should make your way to some point while you're in Kauai. That can be done by visiting it from the Air, we have Helicopter Tours and we have Fixed-wing Aircraft, and you can see on our site discussions about those ways to see it. The only other way, really, is to see it by the sea, because there's no roadways. The road stops at this end, goes in a big circle, it stops here, there's no way you can make a road on that cliff. The only other way to see it is by sea. So that means taking a boat in. 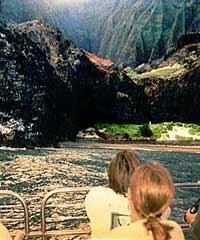 Primarily when we talk about, and certainly in this section, when we talk about visiting the Napali Coastline, we're talking about seeing it via a boat. We have a number of different trips that go in there. 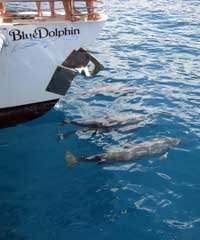 You could take dinner cruises that we have in there, and you can go by on a whale watch or Fishing Charters that go through there and see that coastline. 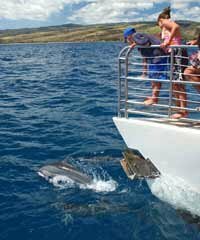 But generally speaking, the major way to get in there to see it and to enjoy it is to do one of the day trips we have that include Snorkeling, and take you out to the Napali Coast. 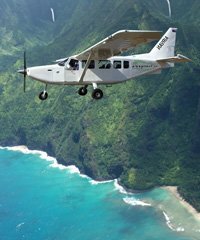 The vast majority of these are going to be leaving from down her at Port Allen, and then working their way up the coast, up to Napali. These are going to be in the five, five and a half hour time period, something like that. 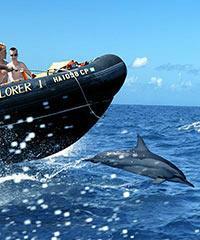 You'll be cruising up, on the way up, one of the delightful things that happens is that you see dolphins, generally. 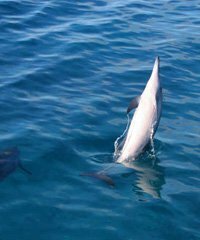 Dolphins are big on Kauai, you seem to see them every time you go out. They're fun to watch, they kind of race you, and they spin out there and jump and cavort and they're just really great pals to have on the way up to Napali. 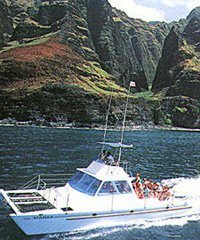 When you get up to Napali, you're going to cruise that area so you can see it from your boat. You'll be taking pictures. Good thing we don't use film anymore, you'd run out of film. It is so beautiful. Then on most of these you're going to have an opportunity to actually get into the water and do some Snorkeling along that area. On the bigger boats, during the summer, which is the only time we have those, generally the only time, the major time we have them, let's put it that way, some of those bigger boats can get up really close to the caves, and sometimes kind of get their nose in a little bit on a nice day, but the smaller boats really just go in, and so you've got that kind of action. But that's not a boat for everyone, they're fast, and they kind of zoom along the surface. For some people it maybe a little bit more of a burden on their back, so it wouldn't be appropriate. It's a little bit more of an adventurous or younger type person usually that would choose those, but they're very, very exciting, very cool. 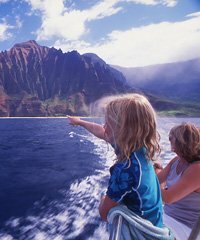 But any way you get up to the Napali Coast is going to be something fantastic to see. 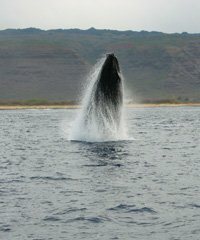 This is something you should be doing while you're on Kauai. The Napali Coastline, don't forget it. It's the place to go. 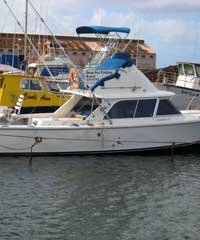 If you have any questions about Tours or Activities in Kauai, just give us a call, or check out tombarefoot.com. We're here to help.